"You ask a pre-kindergarten class what they expect to find in the garden, and one student offers: an octopus. For that student, this is a valid theory. Maybe we will find an octopus out in the garden. Later on, you can use their experience to make a conclusion. Did we see an octopus while we were out in the garden?” Science educator Jeff Winokur posed this scenario to a garden full of early grade teachers at the Henderson Inclusion School in Dorchester. “This is the difference between a student being told her ideas are silly, and feeling like her thinking is valid. When her thinking is supported she does not become overly reliant on the teacher or the book as the ultimate authority. This is important if we want students to understand how to be scientists," he concluded. This fall science educator Jeff Winokur joins CitySprouts in leading a series of professional development workshops to help teachers bridge Massachusetts’ PreK - Grade 2 science standards with the school learning gardens in Boston schoolyards. The aim is to increase the number of Boston children entering third grade with a solid foundation in scientific thinking and content knowledge. In this first of six workshops scheduled for the Henderson School this year, Jeff challenged teachers to consider how very young learners, ages 3 to 6, can begin to engage with science concepts through inquiry in the school garden. He emphasized the importance of allowing time for students to wonder rather than quickly providing them with facts and answers. Teachers were invited to approach the school garden as if they themselves were kindergartners. They explored milkweed plants, roots and all, discovering the milky sap that oozes out of the plants stems, and the fluffy seeds that poured out of pods when cracked open. Jeff emphasized that the names of each plant part were less important than teachers’ hands-on practice of "collecting data" from what they saw and felt. Later on, teachers were provided with some concepts from the Next Generation Science Standards and invited to go outside and explore the school gardens to find evidence of these concepts. Teachers noticed the long, sprawling pumpkin leaves in contrast to the tall, slim corn stalk and wondered how each plant had adapted to its environment. They felt a range of textures, from the roughness of the sage plant to the crinkly mint leaf. Teachers were particularly interested in how the garden can be incorporated into the new Boston Public School FOCUS curriculum. They also wanted to know how learning in the garden can support children’s literacy. Jeff emphasized that inviting students to share their own questions and observations builds key communication skills as well as critical thinking skills. The next early learning workshops won't take place until late November– right about the time CitySprouts Garden Educators are bringing garden learning inside to the classroom. Future sessions will explore how the garden can be brought inside– by setting up experiments growing garlic cloves on window sills, or observing the behavior of snails and worms. 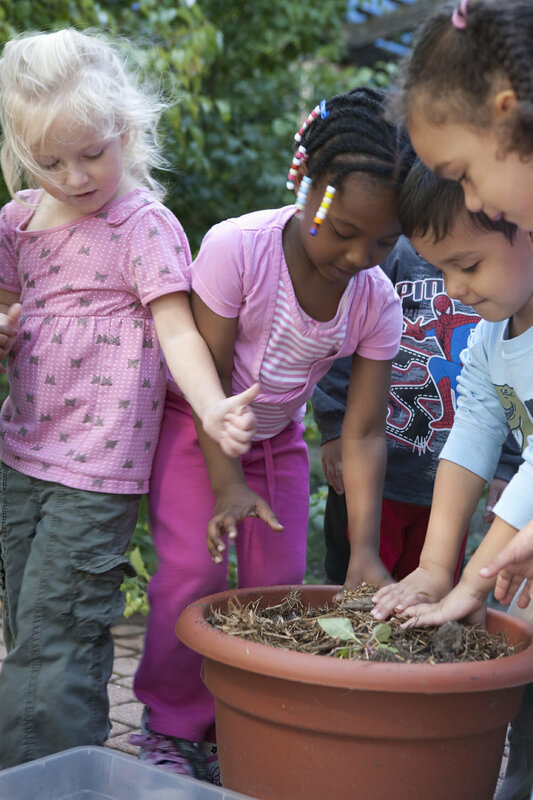 Whether in the classroom or in the garden, exploring living things is a perfect opportunity for students to practice the scientific method, and build a relationship to the natural world.